"I will not allow a generation of children to become addicted to nicotine through e-cigarettes," Scott Gottlieb, commissioner of the Food and Drug Administration, said in a statement. 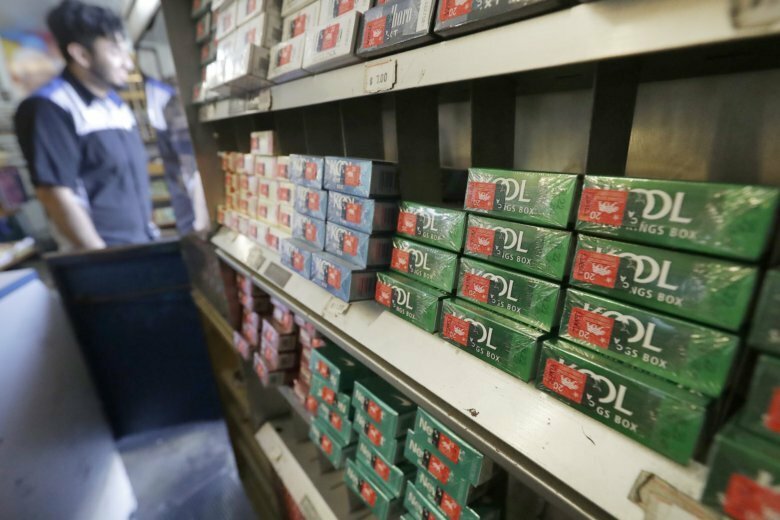 NEW YORK (AP) — In a major new effort to curb smoking, a top U.S. health official pledged Thursday to try to ban menthol cigarettes and flavored cigars and tighten rules governing the sale of most flavored versions of electronic cigarettes. The proposed restrictions were aimed mainly at reducing smoking in kids: About half of teens who smoke cigarettes choose menthols, and flavored e-cigarettes have been blamed for a recent increase in teen vaping rates. Health advocates say a menthol ban would have greater impact on the health of Americans, but it would probably take years to put in place. The changes for e-cigarettes could kick in within a few months. Gottlieb called for additional steps to prevent the marketing of e-cigarettes directly to kids and online sales to minors. He also proposed beefing up measures to ensure that convenience stores and some other retailers do not sell e-cigarettes in kid-friendly flavors such as cherry and vanilla. They could still be sold in vape shops or other businesses that do not admit minors. Smoking is the nation’s leading cause of preventable illness, causing more than 480,000 deaths each year. The FDA currently bans sales of e-cigarettes and tobacco products to those under 18. Gottlieb’s proposal for e-cigarette flavorings also exempts menthol. He said menthol e-cigarettes may be an option for adults who turn to vaping products to quit regular cigarettes, and he decided not to push for an end to menthol flavoring in vaping products. Smoking has been declining for more than five decades. Some 42 percent of U.S. adults smoked in the early 1960s. Last year, the rate was down to 14 percent, according to the Centers for Disease Control and Prevention. Experts credit anti-smoking campaigns, cigarette taxes and smoking bans for most of the decline in the adult rate. But some say adult smokers switching to e-cigarettes have also helped in recent years. But e-cigarette use jumped 78 percent this year among U.S. high school kids and 48 percent among middle school kids, Gottlieb said. He cited a survey this past spring of more than 20,000 middle and high school students. About 21 percent of high schoolers said they had vaped recently, and 5 percent of middle schoolers said they had. Some experts attribute the jump to newer versions of e-cigarettes, like those by Juul Labs Inc. of San Francisco. These products resemble computer flash drives, can be recharged in USB ports and can be used discreetly. “The increase in e-cigarette popularity (among kids) is almost certainly not a function of flavors. All the flavors were out there already,” said Kenneth Warner, a University of Michigan emeritus public health professor who is a leading authority on smoking and health. The FDA has taken earlier steps to investigate the marketing of e-cigarettes by Juul and other companies. Getting out ahead of the FDA announcement, Juul on Tuesday stopped filling store orders for mango, fruit, creme and cucumber pods and will resume sales only to retailers that scan IDs and take other steps to verify a buyer is at least 21. The company said Juul will continue to sell menthol and mint at stores, and sell all flavors through its website. Health advocates generally applauded the e-cigarette plans, but some said they did not go far enough. Some called for a complete ban of flavorings, for example, and a more aggressive regulation of e-cigarettes that have come on the market in the last two years. The proposed sales restrictions on e-cigarettes “are a step forward, but by themselves are not enough to stem the youth e-cigarette epidemic,” said Robin Koval, chief executive of the Truth Initiative, an advocacy group that runs anti-tobacco ads. Gottlieb acknowledged that he could have taken more aggressive steps, “but I don’t want to foreclose opportunities for currently addicted adult smokers” to access e-cigarettes as they try to quit regular smokes. He also said he hopes e-cigarette companies work to restrict kids from buying their products. If current efforts do not succeed, he’s willing to take more steps later, he said. Menthol cigarettes, which contain a minty compound that reduces the harshness of smoke and suppresses coughing, were widely marketed starting in the 1950s and 1960s. Roughly a third of the cigarettes sold today are menthols, according to some estimates. The e-cigarette measures will probably face little opposition, but Gottlieb “has guts” to pursue a menthol prohibition because it will draw political and legal fire from the tobacco industry and its supporters, Warner said.